AFTER THE DARK Clip - "The Bunker"
Who would you like to see Bonnie married to? Which career path would you prefer for Bonnie? does bonnie iron her hair or is it naturally soft???? Do you know which is the real Bonnie Wright hair color? a comment was made to the photo: Oh My! 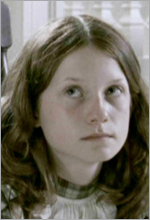 In 2004, Bonnie played a young ______ in the movie "_____: A Life In Pictures"